Let’s look back at the last time we drove off a cliff. The housing cliff. We didn’t call it a “cliff” back then. We preferred slightly slower-moving concepts such as crisis, crash, collapse, meltdown, scandal, fiasco and total f*$# up. In retrospect, though, the housing crash was a cliff. And from its lofty edge, without even a tap on the brakes, flew Bear Stearns, Lehman Brothers, Merrill Lynch, Washington Mutual, Wachovia, Countrywide, AIG, Fannie Mae, Freddie Mac and a slew of other institutions. It was a cliff all right. Some fell hard and exploded into a million flaming pieces, like Lehman Brothers. Others fell hard but their landing was government cushioned, leaving them comatose, crippled and on life support, like Bear Stearns. Still others fell hard but received even greater cushioning, winding up merely in intensive care, embarrassed and unable to pay their medical bill, such as AIG. Or in the case of hedge fund manager John Paulson, ticket to the .0000000001%. Mr. Paulson is perhaps the most famous example of an investor profiting by betting in favor of a crash. His bets against housing gained $15 billion in a single year. But there have been many others, including those described in Michael Lewis’s The Big Short. The hard part is mustering the guts necessary to bet that a massive market failure will occur, even while countless powerful people vigorously try to prevent it. 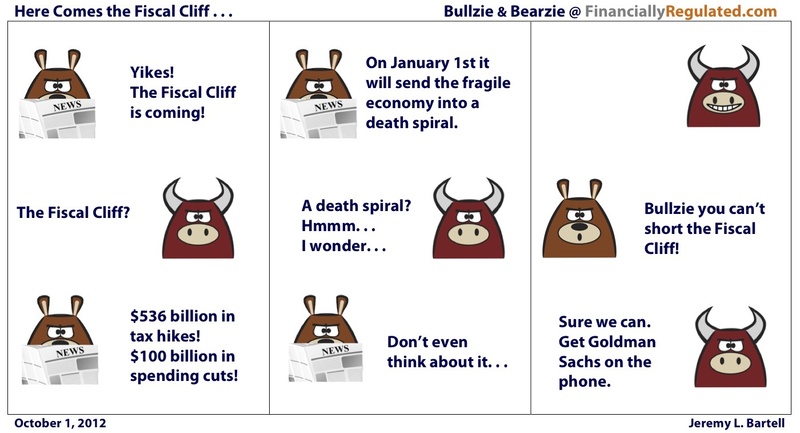 If the fiscal cliff does happen, however, Bullzie will not be the only one minting money. Out there now, with or without the help of Goldman Sachs, are hedge fund managers developing clever ways to profit if the economy drives off the cliff. 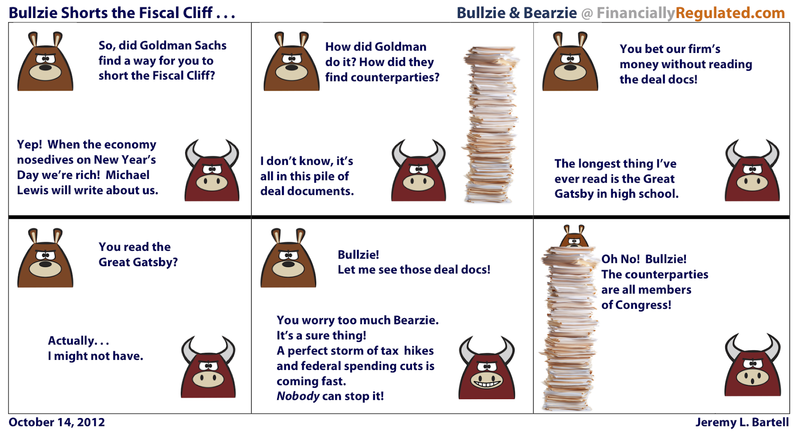 They are short, our fiscal cliff. 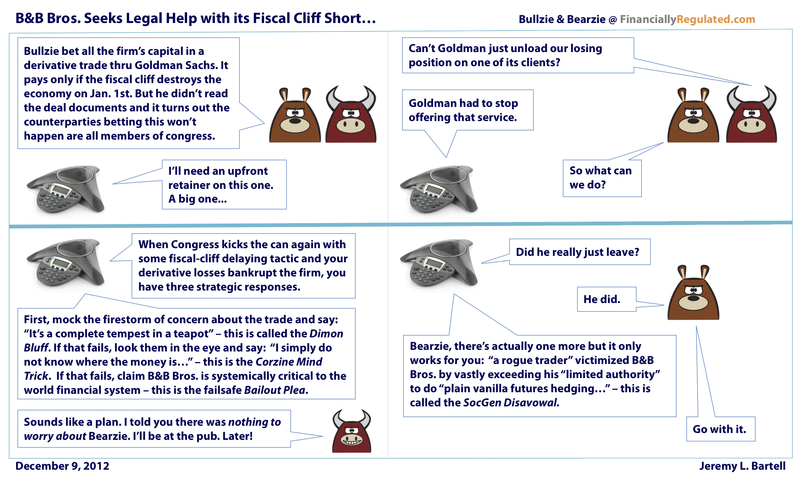 « Bullzie Shorts the Fiscal Cliff.